Newb looking to make a MIDI controller. So, I'm rather new to this whole microcontroller thing but I've been researching for about 2 months. I'm a musician and I'm looking to turn an old supernintendo controller into a midi controller. I was originally looking at the basicstamp, but after scouring the forums I came across a couple threads that lead me to believe that propeller may be a better option. The goal of the project is to send MIDI data out by pressing the buttons of the Supernintendo controller. I'd like the MIDI data to be sent through usb(so I'll probably using the Propstick USB?). I also want all the boards,controllers, and other electronics to be inside the Supernintendo controller. 1. Is my idea feasible with propeller? 2. Is the project too far out of a relative beginners range? 3. I plan on using this kit, http://www.parallax.com/Store/Microcontrollers/BASICStampModules/tabid/134/ProductID/506/List/1/Default.aspx?SortField=UnitCost,ProductName. Would that be all I need? 4. What about power? Would I need some type of powering unit or can I power it using the usb cable? Another question I forgot to ask, can I use PBASIC or do I have to use SPIN? welcome to the propeller-forum ! If it is out of the range of a beginner depends on the complexity what you want to do. ALL propeller-kits are connected via USB to a PC. Really ALL of them. Why this? because nowadays PCs have no more serial COM-Ports. So in the end you have LOGICALLY a V.24 serial connection where the data goes PHYSICALLY through an USB-port. With the Propeller Education Kit - 40 pin DIP Version If you damage the prop-chip you can replace it for $8. The prop-chip is pretty robust but there are limits voltage and current should stay inside to avoid damages. You can interface the propeller almost DIRECTLY to a MIDI-input. This is much much easier than trying to make the prop-chip acting as a USB-device himself. Feel free to aks as many questions as you like. I have already done something like this so I might be able to help out some. I programmed the Propeller to send midi data (note, velocity, channel) to a synth when I pressed buttons on the breadboard. It worked great. My intentions are to send the data to ProTools. So, what is it you want to send to and what data do you want send? I am looking to convert a number from 1 to 120, to, a midi signal containing notes that compare to the number. So the higher the number the higher the note. I seriously hope you can help! It should be as simple as opening serial object and sending out some values. If you cannot get it to work you can try inverting the output. It's assumed that you're using two 220 ohm resistor following the circuit indicated in the MIDI specifications. Thank you! that seems like the whole deal. 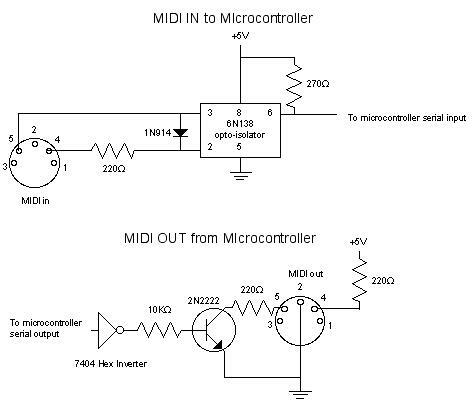 About the wiring setup for the midicable; where can i find this info? i have looked but have not found any wiring setup for propeller. the inverter marked with "A" should be an open-collector (or open-drain) type. You can omit the first inverter, and compensate by the inversion flag in the software. You can omit both, as long as the MCU you're using has open-drain mode (as in our case). So in the end you only need two 220 ohm resistors, one from +5V to pin 4 of the DIN connector, and one between the prop tx pin and pin 5. Pin 2 of the connector goes to ground (only on TX side, note that is disconnected on the MIDI in side to avoid ground loops). If you're driving very long cables, or if you want to keep the Propeller fully safe against output shorts, you'd better use an NPN BJT (or better a 74HC07 gate) to buffer the signal. For BJT connection, look at the second diagram (again the inverter gate can be omitted and compensated in software). P.S. the schematic by Ariba that Bob linked is even simpler, and is perfectly fine with 3.3V supply only, as long as you double check the wiring.